The M12 Light Reconnaissance Vehicle, or ‘Warthog’, is the UNSC’s primary ground transportation vehicle. Available in many variants, the Warthog is an all-wheel-drive, all-wheel-steering, lightly armoured but highly manoeuvrable platform capable of delivering its troops into combat efficiently. Revell’s UNSC Warthog builds up easily from 50 pre-coloured parts to create a highly detailed replica of the UNSC’s principle wheeled troop transport and includes 3 detailed Spartan figures. The light and sound module recreates M49 Vulcan gun firing with flash and engine sounds taken from the video game for maximum excitement!  Durable ABS parts simply snap together - no glue, no mess!  Parts are pre-coloured - no painting required! The D79 Pelican troop carrier is the UNSC’s primary post-Covenant War combat dropship. 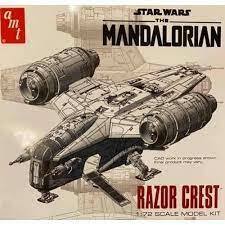 It is a highly versatile transport, able to carry 14 Marines or Spartans, a vehicle, and supplies from orbiting warships directly to battle on a planetary surface, and then provides cover with its close-support weapons. Whether it’s moving troops or cargo, the Pelican dropship is an invaluable tool in the UNSC’s amazing arsenal. 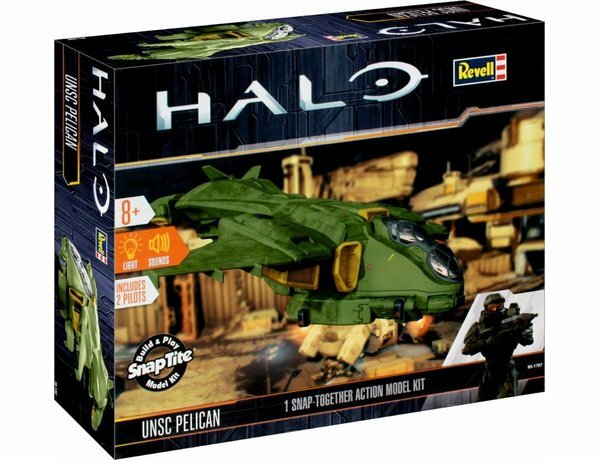 Revell’s UNSC Pelican builds up easily from 50 pre-coloured parts to create a highly detailed replica of the UNSC’s main troop and supply transport and includes 2 Spartan figures. The light and sound module recreates cannon flash, cockpit lights and take-off, flyby and landing sounds taken from the video game for incredible realism! ​SPECIAL OFFER - BUY Both the WARTHOG and the PELICAN £50.00 Saving £12.00! !